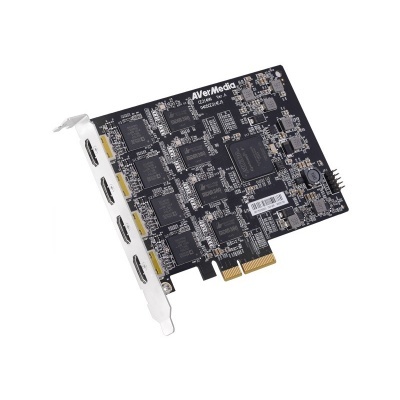 CE314-HN is a PCIe Gen1 x4 capture card equipped with 4 HDMI channels with embedded audio input. With its HDMI video source input it is able to support astounding uncompressed real-time video capturing up to full HD resolution (1920 x 1080 60fps). Along with AVerMedia proprietary SDK, it can be easily and seamlessly integrated into several vertical applications that require superb video quality such as education, IP cam, broadcasting, surveillance, etc. Utilizing software encoding, it offers users the customization ability to tweak or modify codecs’ decompression and compression settings for optimum bit-rate or video quality. With AVerMedia Windows and Linux driver support, clients are able to choose from a wide range of platforms according to your needs; making the CE314-HN the best choice for all full HD professional capturing applications. Compare to single or dual channel capture cards, CE314-HN’s quad channel HDMI video capture interfaces offer more flexibility and versatility on a single card. With 4 channels simultaneous input, CE314-HN is powerful enough to provide concurrent capture of all 4 video channels in full HD quality. One scenario is where when recording a lecture, one capture channel is directed at lecturer’s computer screen, one camera is situated at the rear of lecture hall for maximum viewing angle, and two other cameras placed at the front, on both sides of the stage to cover the lecturer’s position on-stage. AVerMedia hardware-based video engine technology implements practical video processing functions such as de-interlacing for a sharper image, color space conversion for more true-to-life video color and resolution scaling. The functions help reduce the computing burden on hardware and software in order to focus on other important applications at hand.